We remember Abraham Lincoln, America’s sixteenth President, as one of the most important men in our nation’s history. He is credited with winning the Civil War for the North and for permanently ending slavery in the United States. By the end of Lincoln’s presidency, over 600,000 American soldiers had perished and 4 million former slaves were no longer legally considered property. Much of the former structure of the United States was disrupted or destroyed. Lincoln had the conviction to fight the war to total victory (despite its horrific costs) and to constitutionally end slavery, which had been fiercely defended for generations. Being from Illinois, I’ve always been fascinated by Lincoln. He was (and continues to be) a phenomenon that historians are still trying to understand. We know that he lived an incredible life, marked by profound highs and extreme lows. Some believed he may have been bipolar or suffered from major depression; something that may have explained his blunt facial expressions in so many photographs and paintings. The military school I attended, Glenwood Academy, was in part founded by President Lincoln’s son, Robert Todd Lincoln. It’s probably the reason why I’ve had a lifelong curiosity with our sixteenth president. If you were to come into my office, you’d see a poster President Lincoln. Clients often nod their head in his direction as they pass him by as a sign of respect. I’ve always gotten a kick out of that. Several years ago, I was privileged enough to visit the Lincoln Museum in Springfield, Illinois. In case you don’t know, Springfield is the state capital. It also happens to be the town where Lincoln lived while he was in the House of Representatives from 1844 – 1861. You can still visit Abraham Lincoln’s home in Springfield. It’s located at the corner of Eighth and Jackson Streets and is run by the National Parks Service. Many do not know this but this was the only house President Lincoln ever owed. In pouring through the history books, biographies and other available information on Lincoln, I couldn’t help but notice many of his accomplishments. And while most of them are well known, there’s quite a few that are not. Beyond the Civil War and abolition, which have been fundamentally important to subsequent American history, Lincoln founded a number of enduring institutions that changed the nature of government and society. 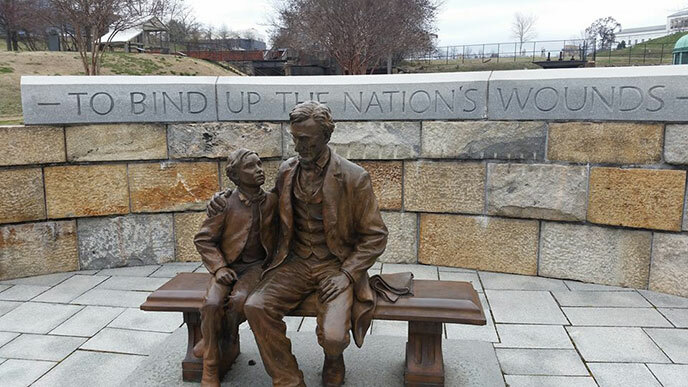 Here are seven lesser-known accomplishments of Abraham Lincoln that deeply impacted American society that might surprise you. In 1861 the seceded states of the South, occupied with their new Confederate government, withdrew their representatives from Congress. With the absence of this bloc of votes, Lincoln and the Republicans passed long-stalled laws of considerable consequence. One such law was the Homestead Acts, which give a small plot of federal land in the west to settlers for free, provided they live and develop the land. All but Confederate soldiers were applicable. This free parcel of land was intended as a foothold on wealth for poor Americans. With the Homestead Acts, Lincoln initiated the transfer of 10% of American land (at the time) to private ownership. These acts and subsequent laws passed in its mold redistributed 420,000 square miles into 1.6 million homesteads. Homesteading in America was over by the 1970s, but it had a lasting impact as the initial wave of white settlement in the West. Another law passed in the absence of the Southern delegation were the Pacific Railroad Acts, authorizing a transcontinental railroad connecting California to the East. The railroads dramatically cut travel times, opening the West to the massive migration of millions in the late-nineteenth century. The government, with its limited money reserved for the war, could not afford to undertake this colossal infrastructure project. So Congress outsourced the work: the government granted land rights to private companies, which the companies then sold to third-party developers, which then funded the engineering and construction of the railroads. In this fashion, the railroad companies gained huge fortunes and political power, and the government turned tracts of empty land into a railroad across America. The first Railroad Act was passed in 1862, and the transcontinental railroad finished in 1869 (long after Lincoln’s death in 1865). Lincoln personally choose the railroad’s starting point in the east – Council Bluffs, Iowa, across the river from Omaha – as a political bone for the Iowa caucus’s presidential support. Land grant colleges, which include most American public universities, were created by the Morill Acts, and signed into law by Abraham Lincoln in 1862. The Act specified that public universities in the states could have an initial endowment of federal lands. This gave fledgling universities land to build their schools; it also gave them enough land to sell, to provide money to construct their buildings and libraries. The principle of the Morill Acts was similar to the Homestead and Railroad Acts: transfer public lands to private hands to stimulate development and increase wealth. It’s interesting that Lincoln privatized so much public property, while also nullifying so much of what had been private property (in abolishing slavery). “The almighty dollar,” that most American of institutions, was first printed under Abraham Lincoln in 1863. The U.S. Note currency, devised to finance the Civil War, is the immediate precursor to the present-day dollar. Astonishing though it may seem today, before Lincoln started printing the greenback dollar there was no federal currency in America. Numerous local currencies were issued by banks; in principle you could redeem your money for precious metals at the specific bank where it was issued. Andrew Jackson had set this stage when, in populist fury, he revoked the charter of the national bank 30 years earlier. The War made the dollar. Lincoln realized that borrowing from banks was inefficient and insufficient to fund the Union army. By printing its own bills, the government could have unlimited access to money at a favorable rate. With the invention of the dollar, Lincoln rang in the modern era of the government borrowing money from itself. There have been some changes to the dollar – like the establishment of the Federal Reserve Bank in 1913 and Richard Nixon’s removal of the dollar from the gold standard in 1971. But the federal American currency started by Lincoln remains one of the strongest global currencies, and is gladly accepted as valuable tender all over the world. Pressed by war to raise funds, Lincoln explored his options under the Constitution and created America’s first ever income tax in 1861. To this point, America was financed through tariffs, bonds, and other taxes. This first ever income tax rate was a 3% flat tax on all income over $600. This was soon changed to a progressive scale where, based on income level, citizens paid either 5%, 3%, or no money at all. Lincoln’s income tax also started the policy of withholding taxes from worker’s pay. Taxes without collection and enforcement don’t produce revenue, so Lincoln also created the Office of the Commissioner of Internal Revenue, which became the storied IRS. The income tax has lived on as the principle means of funding the federal government. What’s interesting is that Mr. Lincoln died at 7:22 am on April 15. As you may know, April 15 happens to be the official deadline for filing federal taxes. In one of his final acts as president, on the very day he was to be struck down by his assassin, Abraham Lincoln created another lasting government institution: the United States Secret Service. This may seem ironic timing, as Secret Service bodyguards might have prevented John Wilkes Booth’s assault. However, the Secret Service founded by Lincoln was not dedicated to presidential protection but to fighting currency counterfeiting. Counterfeit money was a prominent problem in 19 th century finance; fake money weakened the integrity of the currency and caused inflation. The Secret Service were commissioned to find and arrest people who were illegally printing money. Though today primarily known as the agency assigned to protect the president, the Secret Service continues to serve its original function of foiling counterfeiters. Thanksgiving has long been celebrated in America – the Pilgrims held the first such feast long before the American Revolution. By Lincoln’s time, the holiday was over 200 years old. However, what had been an informal holiday was transformed by Abraham Lincoln into a standardized, officially recognized national holiday. November 1863 was the first official Thanksgiving Day; Lincoln proclaimed the last Thursday of the November should henceforth be the official date of the holiday. (Much later, FDR changed Thanksgiving Day to the second to last Thursday of the month, allowing more space before Christmas.) Thanksgiving, of course, remains one of America’s most beloved and deeply observed holidays. From public universities to dollar bills to the IRS, the acts of Abraham Lincoln’s presidency set the stage for modern America, and will continue to influence our history into the future. Abraham Lincoln had a profound impact on the arc of history. Today, many of his accomplishments are still being reviewed by scholars. Not too long ago, I read a fascinating book called: Team of Rivals: The Political Genius of Abraham Lincoln. Page after page, I found myself captivated by Lincoln’s intellect. Moreover, I discovered that Mr. Lincoln didn’t exactly match much of what we hear in American lore. The man had his flaws. He also could be ruthless. I hope you found this profile of a great man in American history to be informative. Please share with others on Facebook! Thank you for stopping by Men’s Culture! National Parks Service. Abraham Lincoln Memorial (2017).